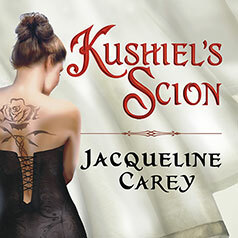 National bestselling author Jacqueline Carey opens a new trilogy set in the same extraordinary world as her extended New York Times bestseller Kushiel's Avatar. Imriel de la Courcel's birth parents are history's most reviled traitors, but his adoptive parents, the Comtesse Phèdre and the warrior-priest Joscelin, are Terre d'Ange's greatest champions. Stolen, tortured, and enslaved as a young boy, Imriel is now a Prince of the Blood; third in line for the throne in a land that revels in art, beauty and desire. It is a court steeped in deeply laid conspiracies—and there are many who would see the young prince dead. Some despise him out of hatred for his mother, Melisande, who nearly destroyed the entire realm in her quest for power. Others because they fear he has inherited his mother's irresistible allure—and her dangerous gifts.